Imagine blasting into the Death Star with Luke Skywalker. Riding shotgun through the streets of San Francisco with Steve McQueen. Feeling Lauren Bacall’s breath on your cheek. The most thrilling cinema experiences are the ones when you feel like you’re actually there, right in the heart of the action. That’s exactly what happens with our Home Cinemas. Our products combines reference-standard power, clarity and control with a design that allows each feature to be custom-fitted into your dedicated home theatre room. Once installed, the speakers are virtually invisible. What’s impossible to ignore is the sound. You’ll be experiencing everything from the roar of a jet engine to the creak of a staircase in extraordinarily life-like, three-dimensional detail. 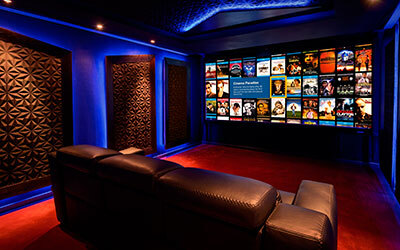 Welcome to the best home theatre system in town. Sound is affected by environment. This is particularly true of a home theatre system, where multiple speakers are installed inside false walls and cabinets in different positions throughout a room. With so many variables affecting the detail of sound at bass frequencies, how can you be sure you’re always getting the most from your system? It’s simple, thanks to our calibration system and experience.